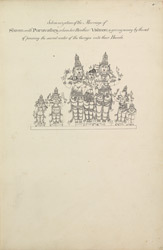 Pen and ink drawing of Shiva and Minakshi’s wedding at Madurai in the presence of Vishnu, carved on a column in the Pudu Mandapam, Madurai, from an 'Album of 51 drawings (57 folios) of buildings, sculpture and paintings in the temple and choultry of Tirumala Nayyak at Madura. c.1801-05', by an anonymous artist working in the South India/Madurai style, c. 1801-1805. Each picture is inscribed with a title and a number in ink. This drawing is of a carving that can be found in the Minakshi Sundareshvara Temple of Madurai, the sacred complex built under the patronage of the Nayaka ruler Tirumala in the 17th century. Within the large enclosure are two temples dedicated to Shiva as Sundareshvara with his consort Minakshi, and several mandapas (halls) with elaborately sculpted columns of the gods from the Hindu pantheon. The Pudu Mandapa is a hall built by Tirumala Nayak between 1622 and 1633 which is situated in front of the east gopura, or entrance tower. It is renowned for the magnificent life-size figures carved on its granite pillars. This drawing depicts the marriage between Shiva as Sundareshvara and Parvati as Minakshi in the presence of Vishnu who is pouring the sacred water in their hands.